Just stop. Whiskey and oats? How have I never heard of this dessert before? I can't wait to try it! I hope you enjoy the cranachan, Lynda! It was devoured almost instantly, so I'll be making it again soon. I may increase the whisky a tad, too... Wishing you a wonderful weekend! wow - your creativity yet marked simplicity is just amazing. Jammy rhubarb with scotch cream - OMG! I had a tough start to the morning, but this post calmed me right down! Oh, Beth, I wish I could have brought you some cranachan. I hope your day improved! 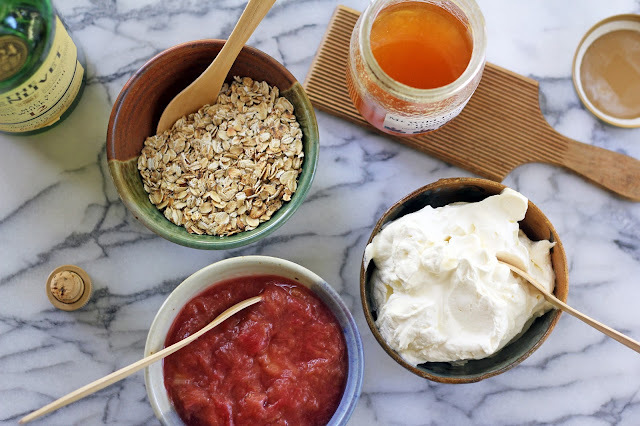 Your description is perfect - "jammy rhubarb with scotch cream" is spot-on. I hope you have a delicious weekend (and knowing what comes out of your kitchen I'm sure you will)! Many thanks, Karista! I appreciate it - so kind of you. Wishing you a marvelous weekend! I am so pinning this!! Yum. Thank you, Tori! I hope you like it - lots of "yums" around here as it was devoured almost instantly. Have a lovely Shabbat! Wow, this is awesome Hannah! I am so used to heavily sweetened Rhubarb desserts it's so nice to see one that works with the Rhubarb more naturally! Thank you, Alyssa! 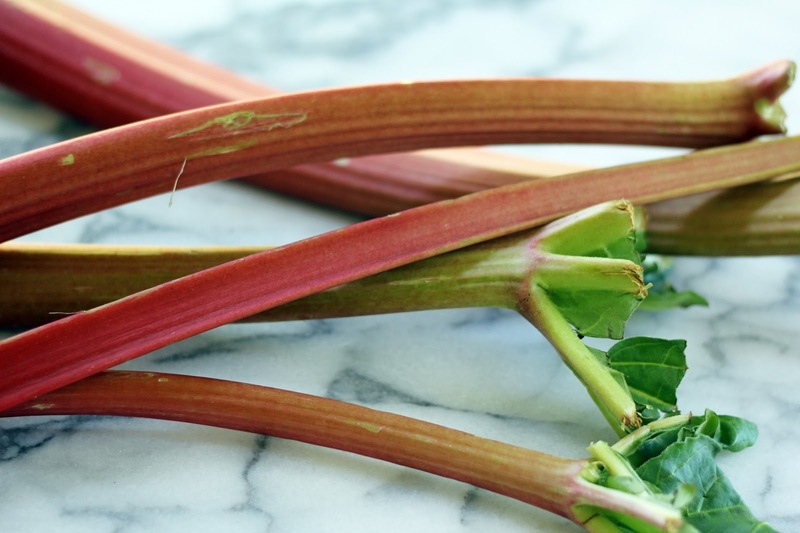 I agree, rhubarb tends to be over-sugared and we lose the fresh, tart flavor. In this case, the cream tempers the tartness a bit but without much sweetness. I think whipped coconut cream would be terrific, too. Have a great weekend! 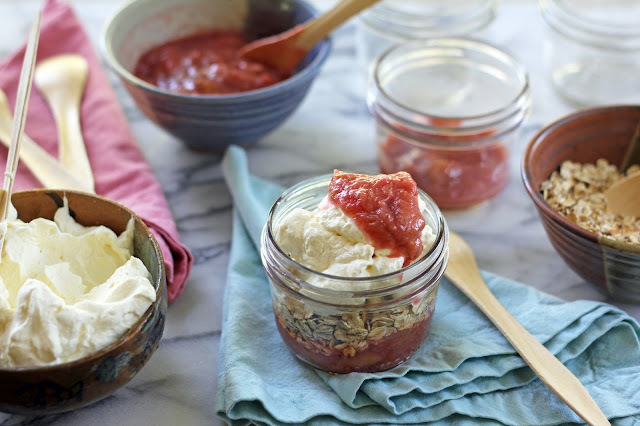 I love cranachan, never tried rhubarb and it's one of my springtime favorites. Must give this a try, I have a box of Familia muesli, bet that would be good subbed for the oats. This sounds fantastic. Oh, I'm delighted you've had cranachan before, Suzanne! It was new to me but I already know it'll be a regular on our dessert menu (must try it with raspberries now!). I think muesli would be marvelous! I hope you enjoy it. Happy weekend! Thank you for the invitation, Carole! I just popped over and linked up. What a terrific, seasonal theme - love the collection of recipes you're sharing! Hannah, thanks for linking in. I have now also pinned this to the special Pinboard I have created for Food on Friday: Rhubarb. http://pinterest.com/ca4ole/food-on-friday-rhubarb/ You can see the other links at a glance there and pick the ones you want to check out. Thank you for pinning it, Carole! I look forward to checking out the other rhubarb recipes. Hannah, this looks wonderful. I've often heard cranachan mentioned on cooking shows and in cook books, but I've never actually tried one. You make it look irresistible, and I love your idea of using rhubarb instead of raspberries. Thank you so much, Sue! Now that we've tried cranachan I have a feeling it will make many appearances on our table...such a lovely treat. Once raspberry season arrives I'll have to give the traditional version a try, too. I've never heard of cranachan before. And now that I have, I think I might be a little bit in love with it. Ohhh, I think I can safely promise you'll love this one, Brooke! I loved it with the rhubarb and now I'm thinking cranachan will be a terrific indulgence all through berry season...strawberries, raspberries, blueberries, marionberries. Can't wait! I've heard of cranachan but didn't know anything about it. Now I feel as if I know everything there is to know! 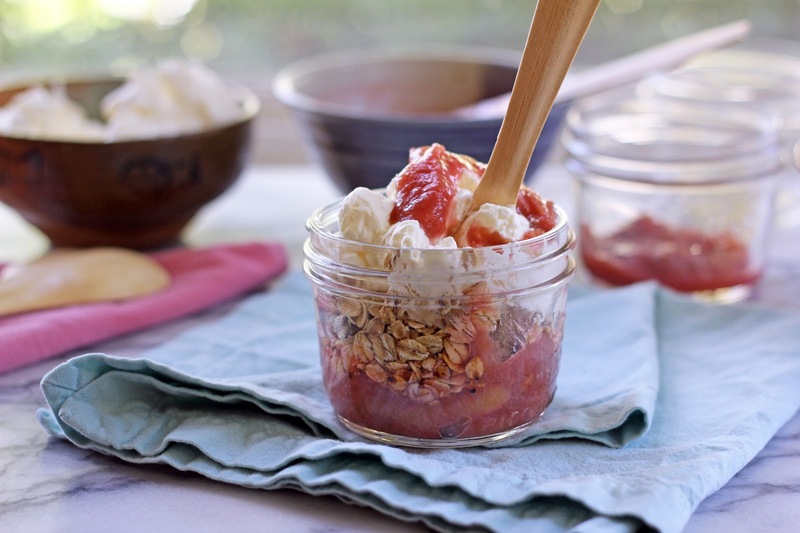 Really great version of this, and an inspired way to use rhubarb. Love this - thanks so much. Thank you, John! It's definitely a pleasure to share about cranachan. We devoured it almost instantly, so I know I'll be making it again soon. Hi Frances, thank you so much for your kind words! I'm happy to connect with you. And I'm envious of your garden rhubarb...we had some years ago and then it got overrun so I need to plant again. I hope you enjoy the cranachan - we devoured it almost instantly! Although this is new dish to me, I love rhubarb and this sounds very creative and healthy to me. I love the natural light coming to the food. Very beautiful! Thank you so much, Nami! I was happy to catch a bit of early morning light (and then eat cranachan for breakfast!). Rhubarb is one of spring's pleasures that I look forward to and I just picked some more up to make jam this weekend. Happy Friday to you! Thank you, Mairi! This really is a marvelous dessert and I'll definitely be making the more traditional one when raspberries are in season. So good! I hope you like it, Orly! As I said, I have a weakness for cream and fruit desserts, so I am happy to try another one. With berry season approaching I'll definitely be making this again with the more traditional raspberries.